In November 2016 Argyle worked with Land and Housing and Lake Maintenance to provide a pop up and local maintenance service to Claymore tenants from Gumnut Cottage Claymore. Argyle staff set up a portable shelter and help desk. Computer services were available on the day so that any past maintenance issues as well as new issues brought forward could be logged and attended to on the spot. Tenants were asked to fill out a maintenance request form with their concerns, nine tenants filled out the form. 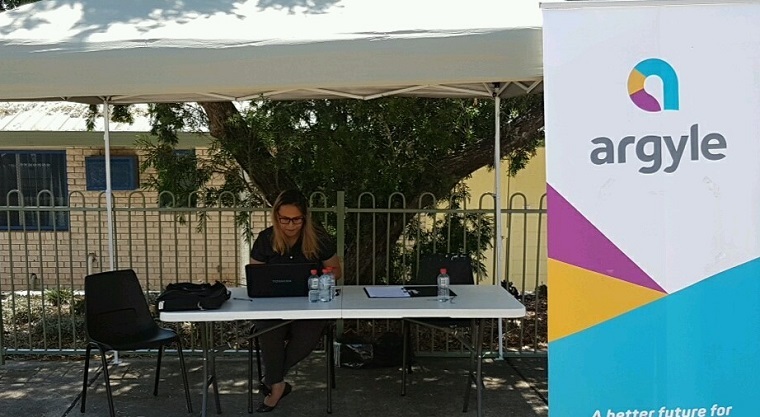 Staff spoke to approximately 30 tenants from the Claymore region and got some valuable feedback regarding maintenance performance and contractor performance. This feedback was 90% positive – overall maintenance was praised for its prompt service and good follow up of repairs however. On the day the pop up service was able to not only take down new request but also follow up progress of works. All in all the day was a success in that as well as picking up maintenance issues that would not normally be reported we gained valuable information and feedback about what tenants expect and want from Argyle. Our team enjoys getting out and staying in touch with community, and we look forward to trialing more great initiatives throughout the year ahead.